The great man and international icon, former South African president Nelson Mandela died last Thursday at the ripe old age of 95. He confounded us, Mandela. And now after his death, his greatness has truly emerged. Think about it. Having spent 27 years in detention before his release in 1990, many expected that Mandela would be like all revolutionary leaders in the world – rule for decades to make up for “lost time”, and justify it on the basis of the high personal price paid for opposing dictatorship (Zimbabwe’s Robert Mugabe, Fidel Castro in Cuba, Jose dos Santos in Angola, our own Yoweri Museveni, all took this route). Perhaps the most surprising thing Mandela did, both for an African or any other world leader is that he stepped down from office after just one five-year term. He was the first African leader to walk from the dinner table after just one course. It would also underscore the point that Mandela’s is a special death. Indeed my own sense is that Mandela divided the broader African politics into two parts – Before Nelson Mandela (BNM), the period covering the 1960s to 1994, and After Nelson Mandela (ANM), the period after he came to power. The BNM age had common fears: The African majority took power; the ethnic mates of the president; the declaration of a one-party state; then either military coups, armed rebellions, or violence following stolen elections. Mandela changed that, making South Africa the first state in Africa where power was shared with the former white “colonial” class when he appointed his predecessor Frederik de Klerk deputy president along with Mbeki. For all the messages of “heartfelt condolences” from African State Houses, I suspect Mandela has left behind examples that African presidents must surely resent him for. •It was bad enough that he chose to retire after his first term. Yes, he might have been 81-years-old, but so what? Mugabe was recently re-elected at the age of 85, and his henchmen are already saying he will stand in the next election – at the age of 89. Mandela’s main “sin”, therefore, according to other African chiefs, must be that he tried to lower the retirement age. •But that is not all, apart from retiring prematurely and lowering the exit age, Mandela then did something unforgivable – he did not try to install one of his sons, daughters, or grandchildren as his successor. He gave the thing to Mbeki, who was not even from his clan or village. What kind of example is that? 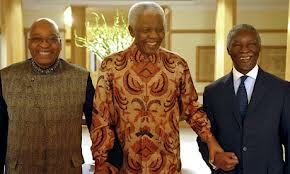 •Then, for all the last couple of years he has been sick, Mandela was treated in South African hospitals. This is a continent where chaps like Cameroon’s President Paul Biya live abroad most of the time, partly so they can be near Western medical care while they let the hospitals at home waste away. Biya only returns home during elections to steal the vote, and then he goes back to Europe to wait for the next one. In the case of Malawi’s Bingu wa Mutharika, though admittedly the doctors there did a lousy job when he collapsed fatally in 2012, his inner circle still went over the top when they chose to fly him to South Africa among other things, because they thought the South Africans would embalm him better! •Now a few days ago, I was in Johannesburg and drove near Mandela’s house in the Houghton suburb. For such a celebrated figure of the Africa’s richest nation, the place was nothing like the palace that other African Big Men who have done less live in. In fact we do not have to go far. South Africa’s president Jacob Zuma has caught a breather with the death of Mandela. Until then, the biggest story in the country was the outrage that followed the revelation that the government splashed $30m (Shs76 billion) of taxpayers’ money to refurbish Zuma’s sprawling village home. The government then tried to suppress the story, by warning the media not to publish photos of the sprawling estate. The media defied the order and published photos of Zuma’s luxury thatched-roof houses in his Nkandla country home. The government had said publishing the photos would be a breach of national security. A South African parliamentary committee that investigated the Nkandla upgrades reported that the exercise was riddled with corruption. Several individuals and companies were awarded tenders without the required security clearance. Even more comical, as The Star newspaper reported, is that even Zuma’s chickens and cattle are catered for because their living places were also identified as potentially a high-security risk! Mandela died without a palace or a resort home one of South Africa’s beautiful many beautiful beaches. Another bad example, Africa’s chiefs would say. The mzee lowered the standards for the presidential crib. Don’t be surprised that among the African presidents who will be in Qunu, some might well be there to see for themselves that Madiba is actually buried.